⚡ [ANN] ⚡ DeepOnion TOR ⚡ DeepVault ⚡ Cryptopia ? Airdrop ? New Rules! Announcements ⚡ [ANN] ⚡ DeepOnion TOR ⚡ DeepVault ⚡ Cryptopia ? Airdrop ? New Rules! "!! Announcements - ⚡ [ANN] ⚡ DeepOnion TOR ⚡ DeepVault ⚡ Cryptopia ? Airdrop ? New Rules! Since 2009 there have been a plethora of cryptocurrencies created. With governments trying to shut down the crypt, there has been a demand for the Anonymous crypto. Whether the government should be a factor or not... privacy is a right. DEEPONION gives you that peace of mind. It is far superior than many other anonymous cryptos out there and currently far undervalued. I would recommend anyone who is looking for a serious contender for a next generation anonymous coin to look into Deep Onions. 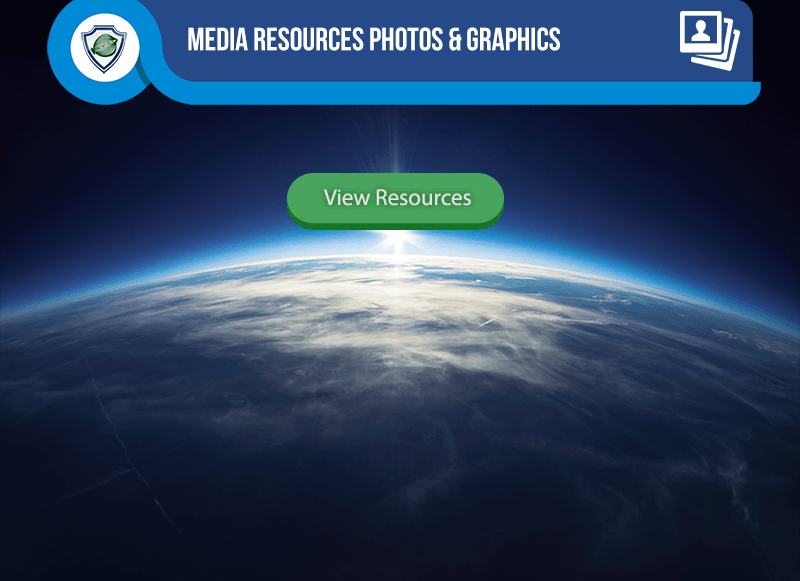 PS: Airdrops are still active so you can even get free onions !! DeepOnion makes your session private because it is on the TOR Network. This coin is the next privacy coin on the history. Total coins will be around 25 millions after 10 years. 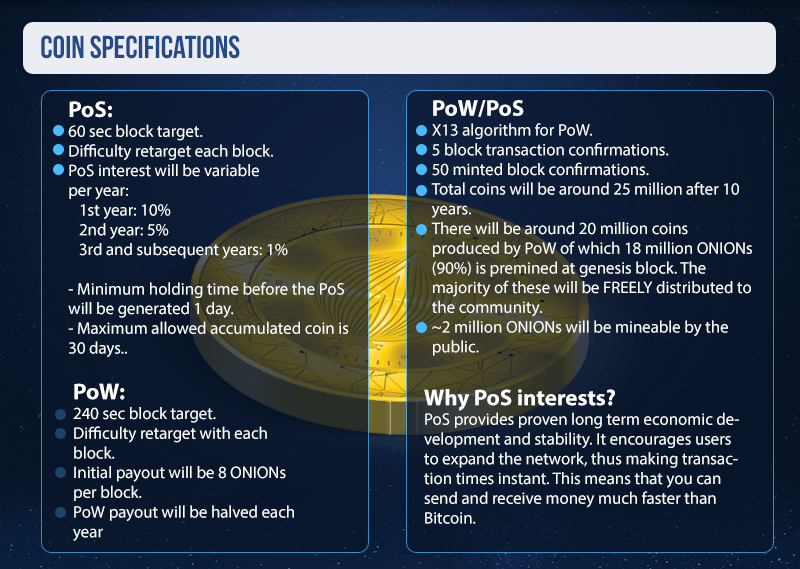 PoW payout will be halved every year, until it reaches 1 ONION/block where it will remain. minimum holding time before the pos will be generated 1 day. maximum allowed accumulated coin is 30 days. I'm doing a giveaway of up to 280 onions to up to 140 people! Well the caveat there is that this is a "daily" giveaway of 2 onions for one lucky winner but still, the aim is to do this every single day up until the 40th airdrop! I will be doing draws every day in the videos of all the comments submitted within the deadline. I recommend that you click the bell button next to the subscribe button so you get alert when new video is up. Cut off for comments is 19:00 PM London time following day. DeepOnion is a very promising coin to invest and I still don't get it why people are not investing in DeepOnion. DeepOnion is currently working on its features, namely DeepVault and DeepSend. If these will be implemented soon, God knows what will happen to the site but all I know is that with these features, DeepOnion will surely take the lead in the crypto market. Also don't forget its thriving community where you can feel the belongingness, having fun in the community and help one another. It is a promising coin indeed with a thriving community, what could go wrong? 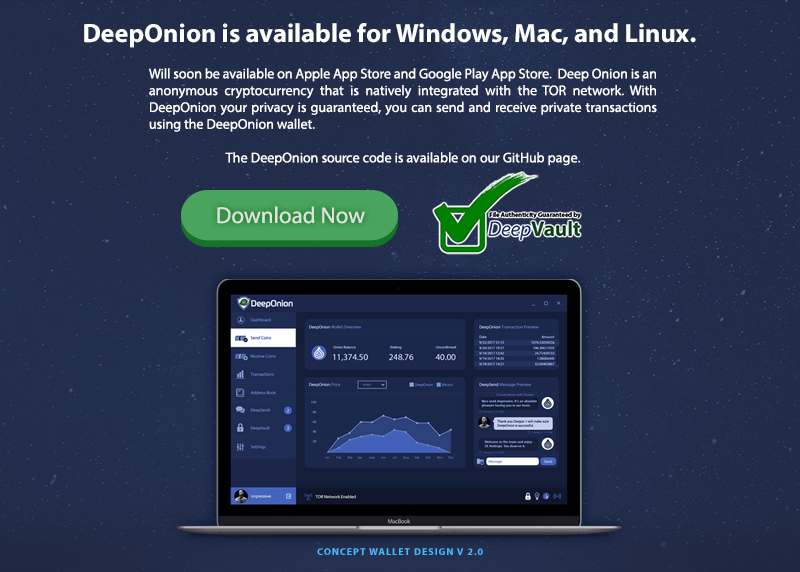 DeepOnion is the future of anonymous crptocurrency which is integrated with the TOR network. With DeepOnion you can send and receive payments privately over the TOR network, keeping your identity safe from government agencies and illegal entities. And what, transaction are super-fast, you have to no longer wait for minutes or hours for payment confirmation. DeepOnion currently trading at $2 has a good perspective from the point of investment. DeepOnion is a very promising coin to invest and I still don't get it why people are not investing in DeepOnion. DeepOnion is currently working on its features, namely DeepVault and DeepSend. If these will be implemented soon, God knows what will happen to the site but all I know is that with these features, DeepOnion will surely take the lead in the crypto market. DeepOnion is a very promising coin to invest and I still don't get it why people are not investing in DeepOnion. 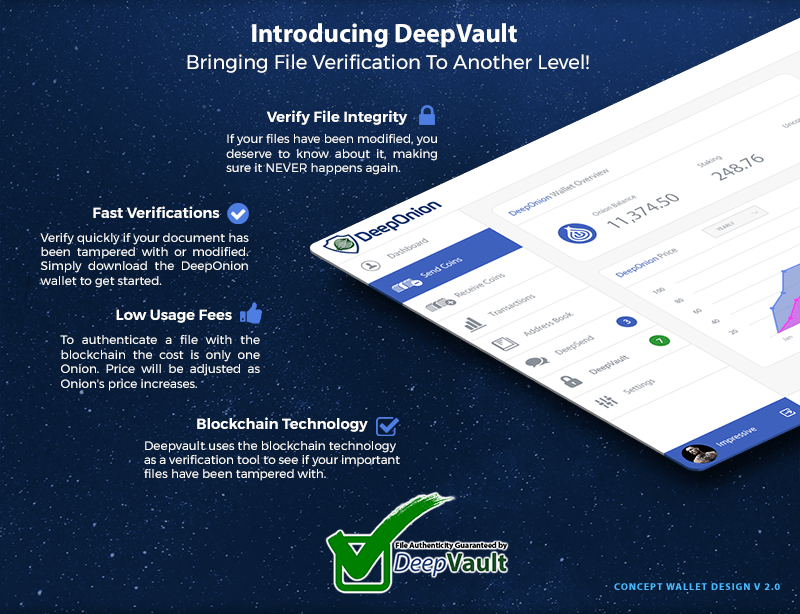 DeepOnion is currently working on its features, namely DeepVault and DeepSend. If these will be implemented soon, God knows what will happen to the site but all I know is that with these features, DeepOnion will surely take the lead in the crypto market. DeepOnion is one of the most promising future top "Anon" coins. At the moment it is GREATLY undervalued. It has so much potential and people are starting to find out. The volume had grown by more than double since yesterday and the core developers have great stuff, such as DeepSend, comming soon! I love the fact that the coin are distributed via Airdrop, and i've personally profited well from the 2 weekly airdrops. Heard a lot of good stuff about this coin which is why I decided to check it out and was left stunned and surprised in a pleasant manner. The developers of DeepOnion were literally handing away millions of dollars through onions to people around the world and expected very less in return which shows how generous they are. The community backing this coin is stellar. Now the issue of anonymous crypto currencies is of interest to many. DeepOnion is an excellent currency and in many ways better than most. This can be evidenced by a rapidly growing community, a clear adherence to the road map, the introduction of new functions and updates. 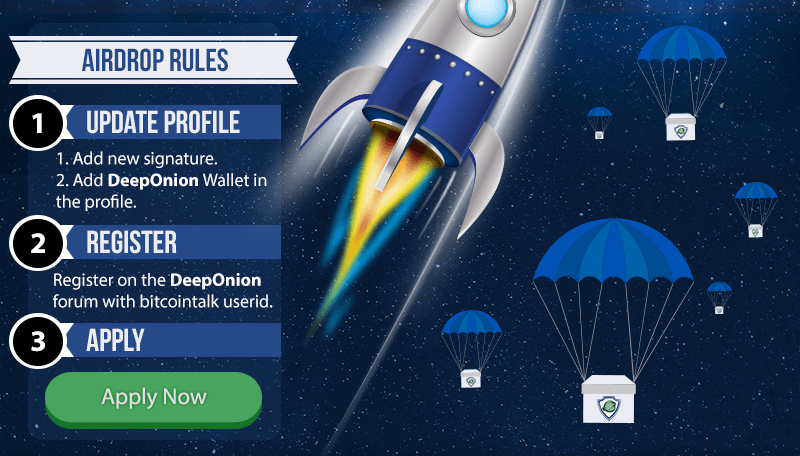 Also do not forget about the weekly distributions of coins, which you can earn by being an active member of the DeepOnion community. Deeponion is definitely one of the best alts out there, as is seen in price increase, community growth. The new features shown here will definitely help the coin grow even more, with deepsend being the best and most anticipated one. I can't wait to see how it will all turn out soon, and i'm putting in my next paycheck in investing into ONION. Keep up! Hello, I'm part of DeepOnion airdrop since 1 month. This coin is really amazing with inovatives features never seen before. ONION Price was $0.5 1 month ago, now it's over $2 and I think it will be around $5 on new year! I vouch for DeepOnion because it offers anonymous transactions and I value privacy. DeepOnion is natively integrated with the TOR network, allowing to send and receive $ONIONs over the TOR network. I've been with the DeepOnion Community less than a month and I agree with all what you had said about it. Actually, those are the reasons why I am also suggesting this to everyone I know in the crypto world. The potential of this anonymous cryptocurrency is off the charts that is why it is one of the altcoins that we needed to watch out next year. It has a lot of potentials and with the amazing progress and developments plus its fast-growing community, it will surely be on top and dominate other altcoins. I believe that DO is the future anonymous cryptocurrency! 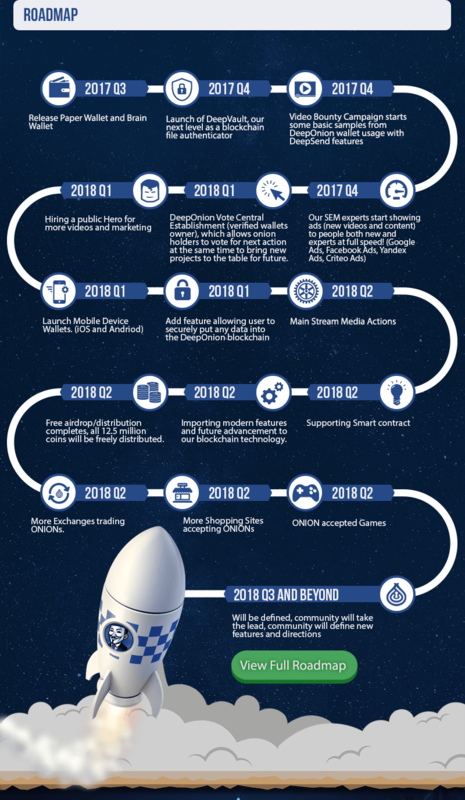 I joined DeepOnion 3 months ago and have been a big fan of it ever since, great dev team, great community, fantastic features and a very promising future, with a increase in price from $0.5 to $2.0 in the space of a few weeks. I have not regretted one single bit since participating. Great! Good to see onions promoting this project. im not part of the airdrop yet but im part of the community where a already made a couple of onion friends. besides that i think its a great project redirecting their anonymous payments through the TOR network. In my opinion it have a great potential. Since i invested in DeepOnion the price more then doubled! For me one big reason to HODL it some more hehe really recomment to check it out! Nice to see a proper DeepOnion ann post here as well. Gotta love how the project is expanding in all directions and that the fud days seem to be gone. More than half of the airdrop is distributed, but there is still room for more members, and the bounties and activity rewards are there as well, so it is not too late to join!